TAKE A CHANCE - LEARN TO DANCE! I started my dance career in 1988 when I began working for the Fred Astaire Dance Studio in Vero Beach, Florida. There were three male instructors at the studio. All three were certified through Fred Astaire and one also had an Imperial Society degree of dance. I received extensive training from these men in all aspects of Ballroom dance and became a certified Fred Astaire dance instructor. During the course of my 12 years with Fred Astaire Studios I competed both within and outside of the Fred Astaire studio chain. I competed professionally with one of the Fred Astaire instructors and I continue to compete and perform shows with my current students. I had the pleasure of dancing for Stevie Wonder and Gloria Estefan in the 1999 Super Bowl and I also perform in many theater productions, grand openings and charitable events. In addition to my Fred Astaire training and in order to stay current with what is happening in the world of dance I continue to study and train with top competitors and nationally recognized instructors. I teach both American and International Style dance as well as other popular dances such as swing, hustle, meringue and salsa. 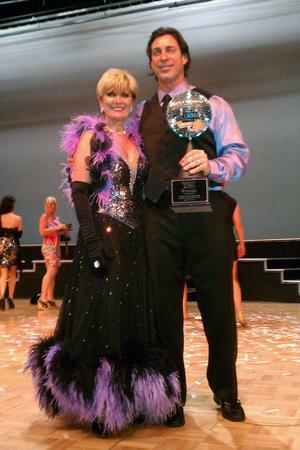 My Vero star amateur partner and I are also the most recent winners of the Dancing with the Vero Stars competition, an annual charity event sponsored by the Healthy Start Coalition.